I'm a big fan of Illamasqua as a brand but unfortunately their products are a little out of my price range. However, every so often Illamasqua launch a sale and a selection of their products become available for absolutely bargain prices, which are usually £5, £7.50, £10 and £15. When Illamasqua do launch a sale, if I have a little bit of spare cash (or quite often even if I can't really afford it!) I usually like to pick up a couple of items. I already own one of Illamasqua's blush duos and I knew I wanted to try a few more of their blushes. When they launched their January sale I resisted for as long as I could but then caved in and headed to the site to place an order, only to discovered that all of the blushes were out of stock. Luckily (although my bank account didn't feel the same!) 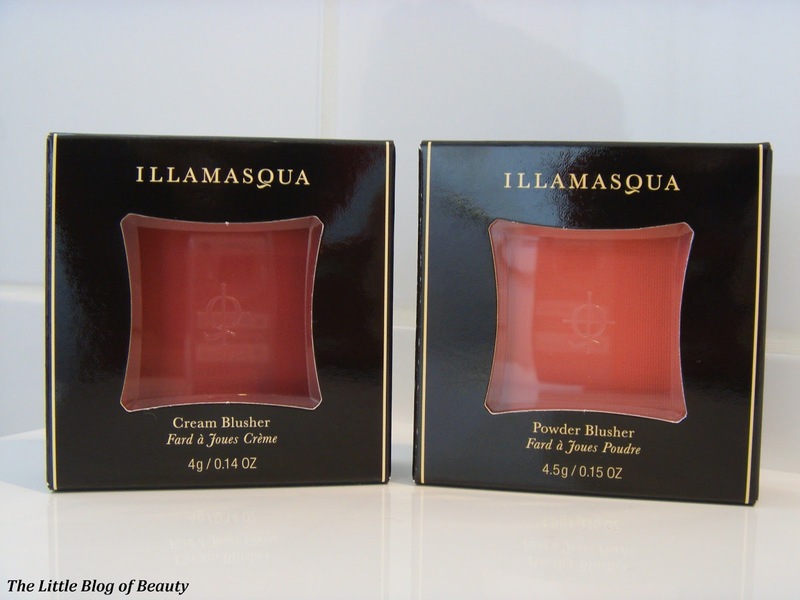 the blushes came back in stock before the sale ended and Illamasqua also offered a code for an additional 10% off sale prices, so I picked up two blushes for just £4.50 each (usually £21.50 each!). 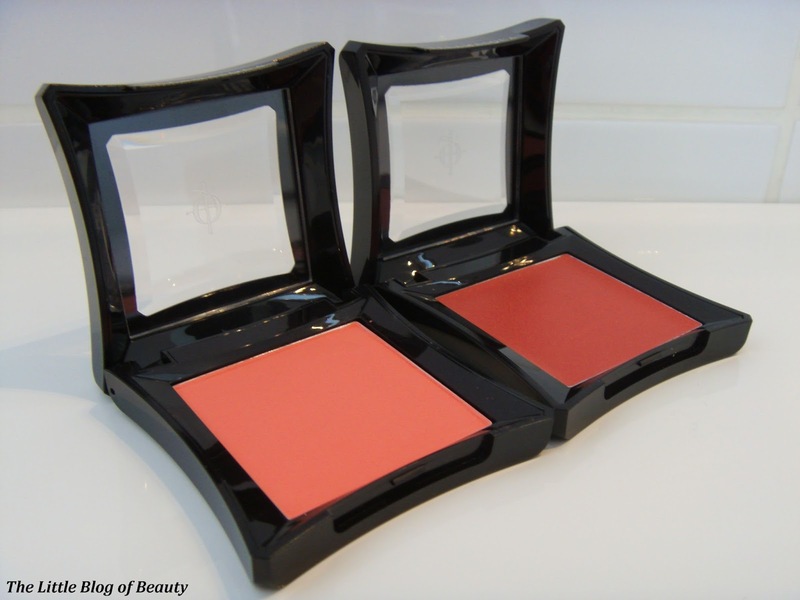 I decided to get a powder blush in Hussy and to try out a cream blush in Seduce. 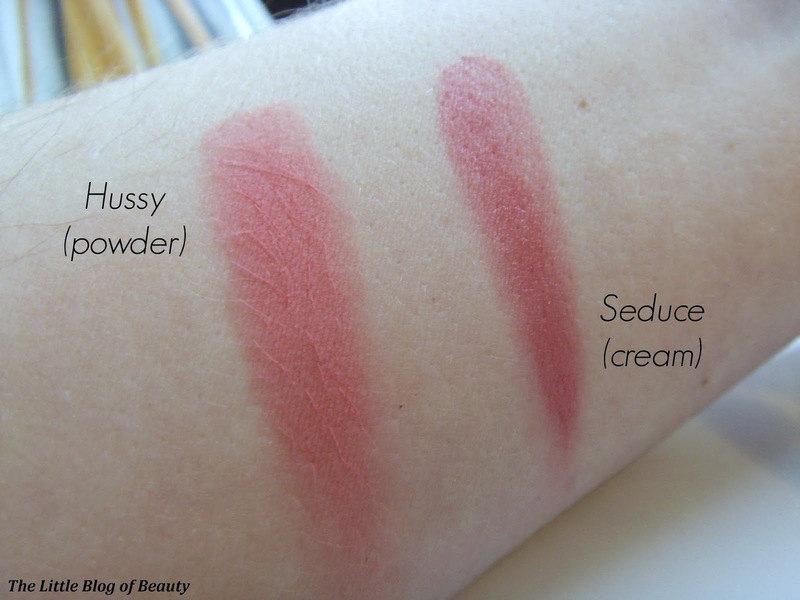 I'm not quite sure what ordering blushes with the names Hussy and Seduce says about me!. 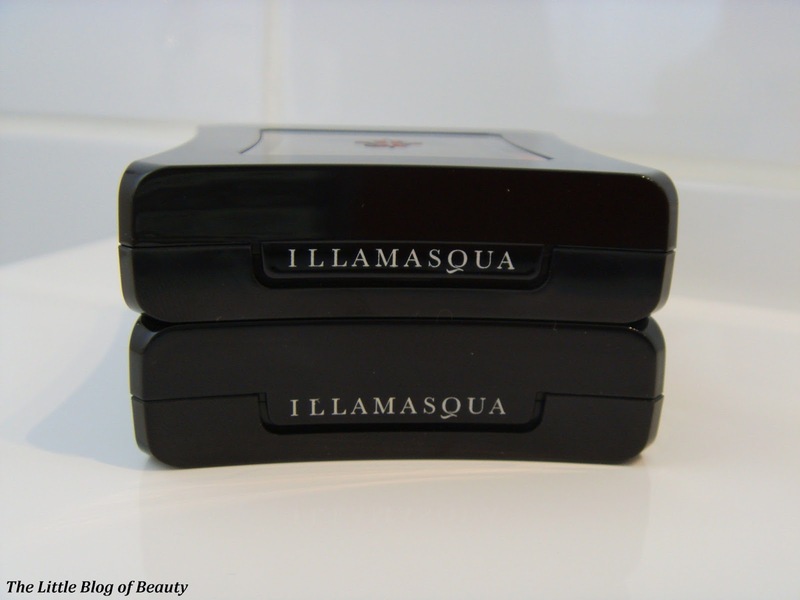 As is standard with Illamasqua products the packaging is black, sleek and simple and I really like it. The blushes are a reasonable size, so might not necessarily be the easiest to travel with, but they do stack nicely so store neatly in whatever storage you use at home. I'm a big fan of powder blushes so knew I wanted to pick a powder one and after using the shade Katie and discovering paler pinks do look good on my pale skin (I was always previously a darker rose shade kinda girl) I decided to try out bright candy pink shade Hussy. Illamasqua blushes have great pigmentation, so you don't need very much, and once this baby is in place it isn't going anywhere! The first time I used this I checked on it 10 hours later and although the rest of my makeup was looking pretty worse for wear, Hussy was still in place. I've used this several times now and it's barely disturbed the woven looking pattern on the surface of the blush, so I can see this lasting for a very long time. Although I've dabbled slightly with one cream blush it didn't really blow me away so I haven't really been a cream blush user. 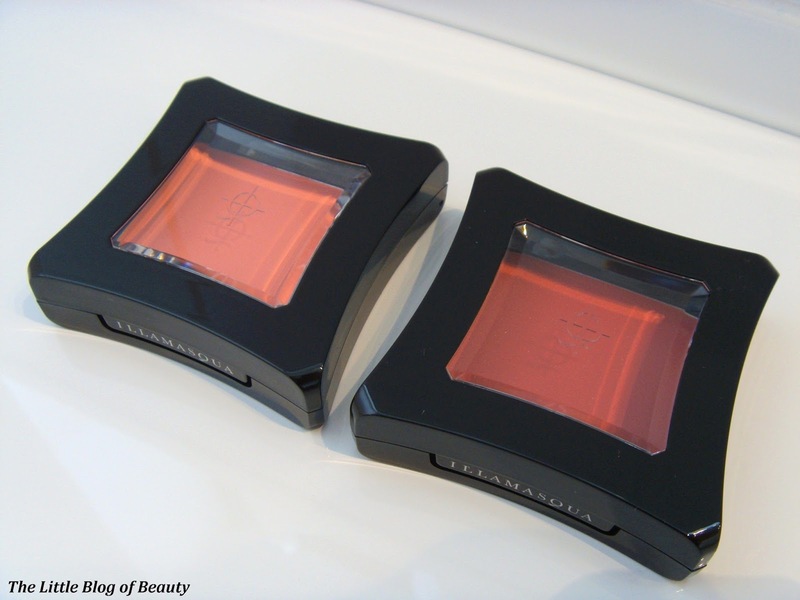 I wanted to try one of Illamasqua's cream blushes though as I know how good their products are. I decided to go for Seduce as this is a warm rose pink which is much closer to the kind of shade I've used for years and so shade wise, definitely in my comfort zone. A little warning with this one though, it's definitely best to start with a tiny amount and build up to how you want it to look. A few days ago I wasn't paying attention to what I was doing, I tapped my Real Techniques Stippling brush on top of the blush and started applying and lets just say it looked like somebody had slapped me pretty hard! I haven't actually consciously checked how long this one lasts. I don't think it's quite as long as their powder blushes but even then that is still very impressive. Just as a note I do have dry cheeks, so if you do suffer with oily cheeks this may not last as long. Overall I'm really impressed with both of these blushes and Illamasqua blushes in general are definitely one of my favourites. These are available from the Illamasqua website, Illamasqua stores or concessions in selected department stores.